In my quest for the perfect breakfast muffin, I’ve made Banana Strawberry Oatmeal Muffins and Whole Wheat Chocolate Cherry Muffins. 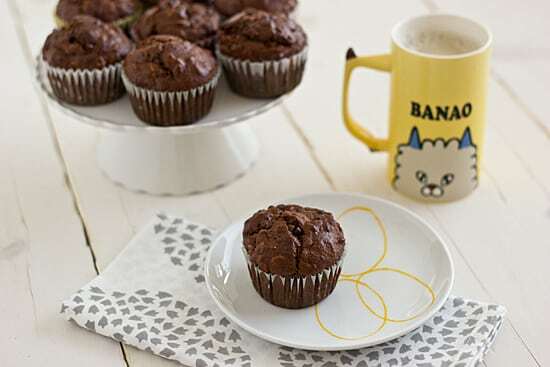 But these Dark Chocolate Banana Breakfast Muffins are my current pick for favorite breakfast muffin. They’re just chocolatey enough to make things exciting, without being so chocolatey that you feel like you’re eating a cupcake for breakfast. Like most of the baked goods I make, I let these cool to room temperature and then I threw them in the freezer. (Well, I put them in a freezer bag and then I threw them in the freezer.) Since it’s just my husband and me in our household, polishing off a batch of muffins or cookies before they go stale just isn’t the best idea, particularly since I’m trying to lose weight. So freezing everything right away gets rid of that “Well, if I don’t eat these, they’ll go bad!” excuse. When I’m having a muffin for breakfast, I let it thaw on the countertop overnight or I microwave it for 20-30 seconds so it’s nice and warm, like it just came out of the oven. Muffins and most cookies tend to freeze pretty well–I haven’t had any issues so far. Just don’t leave them in the freezer for months and months at a time and you’re good. My favorite breakfast muffin! If the Greek yogurt, whole wheat flour, bananas, and oats aren’t enough to persuade you, the dark chocolate pieces will. Preheat oven to 400 degrees. Spray muffin pan with cooking spray or fill with 12 paper liners. In a medium bowl, sift together flour, baking powder, baking soda, and cocoa powder. In a large bowl, stir together brown sugar and oats. Add yogurt, banana, canola oil, and egg and stir until well-combined. Pour dry mixture into wet mixture. Stir until moistened–batter will be thick. Fold in dark chocolate. Divide batter into muffin cups. Bake for 17-20 minutes or until toothpick inserted into the center of a muffin comes out clean. Mmmmm these look delicious! I can’t wait to try it out, especially since I just bought a tin for a half dozen over-sized muffins on Woot! not too long ago. Bananas, chocolate, oats… All of my favorites wrapped into one. Could I make these dairy free without the yogurt? These are wonderful. I made them for my family last week and they were a huge hit. I did use just regular whole wheat flour and carob chips (as that’s all I had on hand), and they were super good and went way too fast. I think next time around I’ll use less sugar as the bananas add a lot of sweetness to begin with. Loving on your blog, beeteedubs. Where did you get that mug? It’s amazing! I bought it in Japan. It’s definitely my most precious possession.